After sailing over 140nm we ended up motoring the last few miles virtually straight into the wind as we made our way into the Le Marin anchorage on Southern Martinique. For the first time since our start of cruising we were in an anchorage where US vessels were out numbered, yes Martinique certainly is French. Marin is a huge bay, about 2 miles by 2 miles with several hundred yachts anchored or moored. For the first time since leaving Grand Cayman Island over a year ago we were in a first world country. Check in was the most straight forward so far as Martinique now uses the new E-seaclear computerized check in. If you have a net connection on board you can even do it from your boat and just present yourself, with passports, to the combined customs and immigration office. This is how it should be in this day and age. Le Marin certainly caters for sailors, first rate chandleries, internet Wi-Fi (it took us some time to discover the best Wi-Fi), provisioning (a major bulk purchase supermarket where you can take the trolley right to the dingy), repair facilities and a myriad of marine specialty stores, enough to keep a bloke occupied for days. We were out investigating immediately. As with all new spots it takes time to work out how even the most rudimentary things operation. Shop opening and closing hours (here they all close for the 2 hour siesta) buses (combination of buses and Communal Taxis, no timetables), where things are located (being able to get there and back without getting lost) etc, etc, in this regard the tourist office was very good, heaps of publications, store indexes and maps. One thing needed was our last hepatitis B injection, a course of 3 injections, the second one month after the first, and the third 6 months later. The first two we had in Panama, at the local hospital in Bocos Del Toro, no charge, the third was due February, now in Martinique. Off we went to the local hospital in Marin, no can't get them here, need to go to a GP. 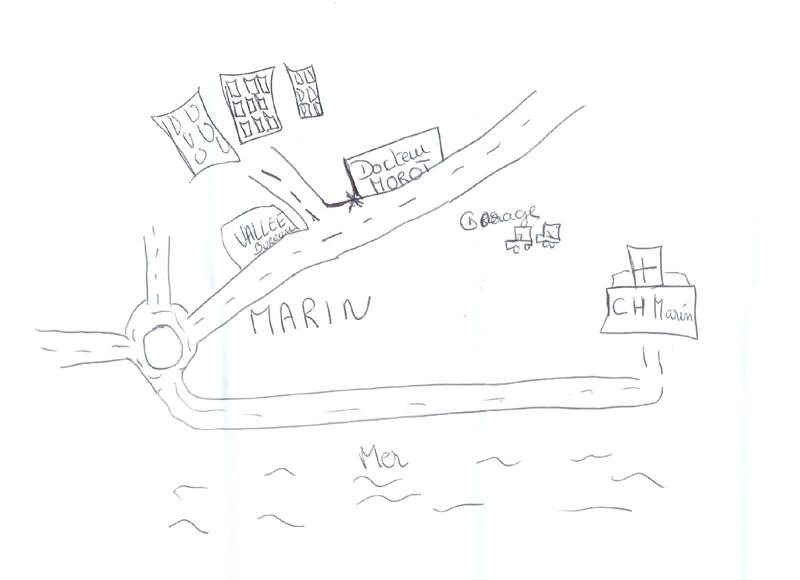 The young lady at the front desk in the hospital was just so helpful; she drew a wonderful mud map for us and slowly explained, in French, how to get to the nearby GP. The GP, a great guy very interested in where we had been and what we were doing, gave us a script to get the serum from the Chemist and back we went to the GP for the injection. A couple of hours later we had our injections and were a couple of hundred dollars the poorer. Somewhat different to just walking into the hospital in Bocos but what wonderful people we met in the process. We also discovered walking trails, marked on maps, well described and sign posted. We were soon onto these as we both love trekking, well a few hours, not days, at a time. The first couple, about 15km each, we certainly felt as we had hardly walked since China, 3 months ago. It got easier and as the old legs got used to it, over the next week we walked another 4 trails, all fairly hilly, one from sea level to over 400m, Morne Larcher, quite a steep climb for much of it but very rewarding views at the top. At the top we had our picnic lunch, on the grass, under a tree, looking out over one of the Southern Bays and out to Diamond Rock. Another couple of people came by, not a couple, and we got talking, they had only met the day before and decided to walk this particular trail, Catherine and Bert. Bert had been in Perth in 2005, for a few months, as a backpacker, small world. They offered to drive back, from the base of the trail, to the boat, we suggested that if they happened to see us on the road it would be great. We had only walked about 1km when they picked us up. They joined us on Ednbal for a few beverages and a bit of tucker. What a great day. From St Anne we were bay hopping, well cove hopping, in French, Anse means cove, Petite Anse D'Arlet, Grand Anse, Anse L'Ane, Anse Mitan, Anse La Mitan, Anse Noire, Ance Dufuor, before heading over to the capital Fort De France. All was well except one small problem, a general strike. By the time we got to Fort De France it was in full force, no fuel, no services, no food, almost no shops open at all. Garbage mounting up and the city almost deserted until the union parades, even the much awaited carnival was looking very shaky. Here we stayed for a week hoping that any day things will go back to normal and carnival will be in full swing. It was not to be. We had been waiting for mail from both Aus and US but with the strike there was no delivery and with no public transport the only way to make an alternative arrangement was to sail around Le Marin and talk to people in Port Captain's office who had so kindly given us a mailing address. The very helpful lady agreed to forward our mail onto St Maarten where we have another mailing address, should the mail eventually arrive! All in all we found our experience in strike bound Martinique somewhat frustrating. So, with some provisions, notidely beer dwindling we made plans to head to Dominica on the last day of February, 2009. We decided to sail up the Western side of Martinique to stop over at St Pierre before heading off to Dominica. Just before St Pierre was the bay of La Carbet that had a lovely long beach, albeit black sand, and, within walking distance, the Neisson rum distillery, one of 12 on Martinique. So, we anchored at La Carbet before lunch and walked to the distillery in the afternoon. Unfortunately the distillery itself was not working, another strike victim, but the shop for rum tasting and buying was open, oh bugger! We were the only ones there so had ample opportunity to taste and of course to buy a couple of bottles. Somehow the walk back to the boat took longer than the walk to the distillery. By late afternoon we were anchored in the bay, with 20 or so other yachts, at St Pierre, in the shadow of the still active volcano, Mt Pele'. Mt Pele's last major eruption was 8 May 1902. On that faithful day, when St Pierre was the capital of Martinique and known as "little Paris", all 30,000 inhabitants, save one, perished. Mt Pele' belched out super heated dense gas and fine super dust that descended on the 200 year old city. In 800 degrees Celsius heat the mostly wooden buildings and all the ships, many there for the rum trade, in the harbour, spontaneously combusted. The only survivor was a prisoner on the jail dungeon who, badly burnt was found three days later. The local museum records the eruption with some early photographs and relics like melted glass bottles, the partly melted bronze bell from the cathedral etc etc. Apparently the heat was similar to an atomic explosion. St Pierre had many points of interest as well as one particularly interesting trail within walking distance. The most interesting point was Depaz rum distillery, although not actually working, was open for self guided tours. It had been one of 19 distilleries in St Pierre in 1902, resurrected by some members of the family who were not in St Pierre on the faithful day. The original water wheel that used to power the sugar cane crushing, using 60,000 liters of water per hour to develop 6ph was still turning but, unlike the River Antoine distillery in Grenada, it was no longer powering the distillery that was left to steam engines using steam generated by heat from burning the remnants of the crushed sugar cane. The self guided tour was superbly done enabling visitors to see all the production process with explanatory notices and illustrations all the way through. Then of course was the tasting and purchasing! Finally the walk back to the dingy caring yet more rum. One of the more popular walk trails was a short distance from St Pierre town but with the walk to the 3.5km trail and back from the end, via the Mt Pele' observatory we would have a round trip of 14 or so kilometers. Definitely a packed lunch and water bag job. By 8:30 we were walking out of St Pierre up the first hill. By the time we were at the top, 280m up we were already about buggered, but then came the easy bit, down hill to the actual walk trail itself. Until now it had all been on road. The walk trail is special because it is along the bank of a canal. Not just any canal but one built in the 16th century to supply water to 4 rum distilleries along its path. The canal, a little more than half a meter wide and similar depth rises from 100m to 200m altitude over its length of 3.5km. As you walk along the canal wall, about a third of a meter wide, you have the water on one side and, for most of the time, a shear drop of 50 to 100m on the other down to the valley below. The canal was basically built on the side of the mountain, quite incredible. Towards the end of the canal, well the end for us but really the beginning, where it gets its water from a river, there is a small tunnel that the canal runs through, the whole thing was just fantastic. By the time we got to the road it was getting very close to beer o'clock but we still had some up hill to go so decided to put off the pleasure until the worst was over!. On one of the roads there was a sign warning of the gradient, 25%!! We stopped at a small park at just over 500m for our beer thinking it was pretty much down hill to our next stop, the Mt Pele' observatory. Wrong. By the time we got there we were at 630m. Not only that but the observatory was closed and it was starting to rain, fine misty rain from clouds forced by the terrain to climb higher and start precipitating. We needed somewhere to shelter for lunch. The observatory, built in 1937 was perched on top of the mountain with a commanding view, of course right across to Mt Pele' about 30km to the North so, had we not been in the clouds, we would have breath taking views. So, for shelter, we jumped the fence, found a porch around the back, laid out our picnic mat and poured the GnTs. After refreshing beverages and Sasha's lovely packed lunch we headed off in sunshine again. Just down the road we met with a guy and checked directions, yes we were on the right road. With a lovely French accent he told us there would be few cars as the island was in the midst of a "social war"! In an unexpectedly short time the sealed road became a track and before long we were walking through someone’s farm tracks, must have missed a turn somewhere, all Sasha's fault of course. As intrepid trekkers we kept going, al least down hill and roughly in the right direction. Bonus, we found ripe avocados on the ground. Eventually, just before the skipper was ready to lie down and die we hit a road and, with more directions eventually made it back to St Pierre, some 20km and 8 hours after setting off. Slept well that night.